Looking at the U.S. Energy Profile, one can see that the U.S. is now the world's second largest energy producer and consumer in the world next to China, and netimporter. It can be seen from the imports profile that the US Crude oil imports have significantly reduced between 2005 and 2015 from a peak of 25 Quadrillion BTUs. Another significant change that can be noted is that the US is now exporting natural gas (below zero on the y axis) instead of importing it. eleventh in worldwide reserves of oil. Source: U.S. Energy Information Administration/Annual Energy Review 2018 . 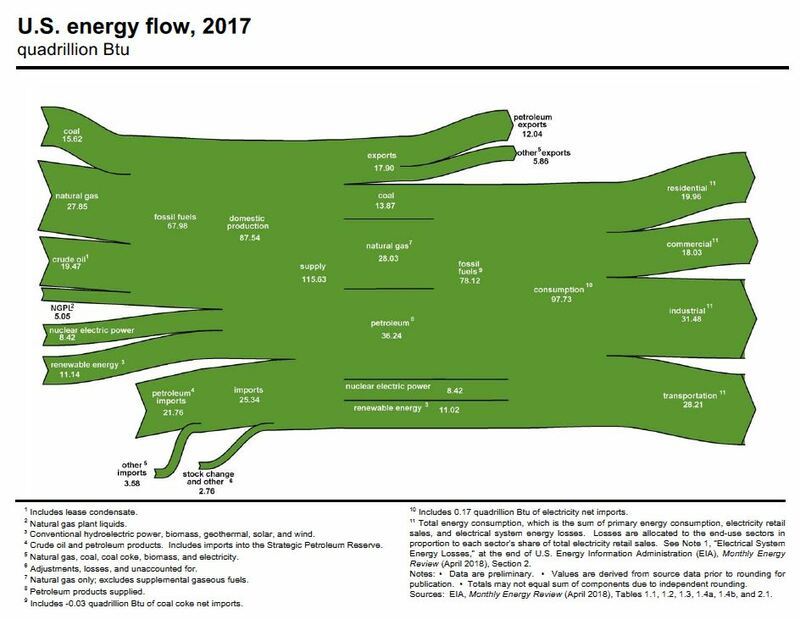 US Energy Consumption by Source and the chart of the US Energy consumption by source and user sector shows each energy source and the amount of energy it supplies in British thermal units (BTU). Petroleum is the leading source of energy in the US in 2017 with 36.2 quadrillion BTUs. Next is natural gas with 28.0 quadrillion BTUs. Coal supplies 13.9 quadrillion BTUs of energy. Renewable energy and nuclear power are responsible for 11.0 and 8.4 quadrillion BTUs respectively. Of the total petroleum consumption, 72% is used for transportation and another 23% is used by the industrial sector. Similarly, 35% of the natural gas (largest fraction) is used for power generation. On the other hand, 76% of the residential and commercial energy needs are met by natural gas. The actual percentages are not required to be memorized but answers to the questions such as: Which fuel is most used by power plants for power generation? Which sector uses petroleum the most? Approximately what fraction of the electricity is generated by renewable energy? (10, 25, 50 or 90) What is the primary purpose of coal use? etc. The graph shows how dependent the U.S. is on our petroleum supply, as it accounts for almost 37% of our energy. Our next two highest sources of energy, like petroleum, are non-renewable and include natural gas and coal. Only about 11% of our energy comes from renewable energy sources such as wood and water (hydroelectricity). In 2015, fossil fuels made up 81.5% of total U.S. energy consumption, the lowest fossil fuel share in the past century. According to EIA projections, the percentage declines to 76.6% by 2040. Policy changes or technology breakthroughs that go beyond the trend improvements could significantly change that projection. In 2015, the renewable share of energy consumption in the United States was its largest since the 1930s at nearly 10%. The greatest growth in renewables over the past decade has been in solar and wind electricity generation. Liquid biofuels have also increased in recent years, contributing to the growing renewable share of total energy consumption. The most significant decline in recent years has been coal: U.S. coal consumption fell 13% in 2015, the highest annual percentage decrease of any fossil fuel in the past 50 years. Biomass, which includes wood as well as liquid biofuels like ethanol and biodiesel, remain relatively flat, as wood use declines and biofuel use increases slightly. In contrast, wind and solar are among the fastest-growing energy sources  in the projection, ultimately surpassing biomass and nuclear, and nearly exceeding coal consumption by 2040. The U.S.A.’s Energy Sources and Their Future Outlook. The table below summarizes the U.S.’s energy sources and their future outlook. In 2010, domestic supply was 14.72 million barrels per day and net imports were 9.17 million barrels per day. The trend of increasing U.S. dependence on imported oil in the past decade is expected to continue. In 2015, the United States imported approximately 9.4 million barrels per day (MMb/d) of petroleum from about82 countries. Petroleum includes crude oil, natural gas plant liquids, liquefied refinery gases, refined petroleum products such as gasoline and diesel fuel, and biofuels including ethanol and biodiesel. About 78% of gross petroleum imports were crude oil. In 2015, the United Statesexportedabout 4.8 MMb/d of petroleum to 136 countries. Most of the exports were petroleum products. The resulting net imports (imports minus exports) of petroleum were about4.6 MMb/d. Net U.S. imports of energy declined from 30% of total energy consumption in 2005 to 13% in 2013 and down to 7.6 % in 2017, as a result of strong growth in domestic oil and dry natural gas production from tight formations and slow growth of total energy consumption. A pie chart of US energy consumption in 2012 shows the percentage of each type of energy that was consumed for that year. Renewables 8%, nuclear 9%, coal 21%, natural gas 25%, and oil 37%. A second pie chart of the US energy consumption in 2035 shows the prediction of the percentage of each type of energy that will be consumed for that year. Renewables 16%, nuclear 9%, coal 20%, natural gas 26%, and oil 32%. The history of the energy consumption profile of the United States indicates that petroleum makes the largest part of the energy demand over the past seven decades. Natural gas has taken the second. Over the past decade with the production of gas from shale. Coal is slowly being replaced by natural gas for power generation over the past decade. Renewable energy is growing at a much faster rate. Among the renewable energy sources, biomass has the larger share followed by hydroelectric energy. Wind energy and solar energy are the fastest growing energy sources. Answers to the following questions need to be looked for in the material presented above. Of all the renewable energy sources, which renewable source is used most? Which of the renewable sources is used most for transportation? Petroleum demand is projected to grow from 19.17 million barrels per day in 2010 to 19.9 million barrels per day in 2035. Approximately 72.1% of the petroleum in the U. S. is used for transportation and about 22.5% is used by the industrial sector. Total dry natural gas production in the United States increased by 35% from 2005 to 2013, with the natural gas share of total U.S. energy consumption rising from 23% to 28%. Production growth resulted largely from the development of shale gas resources. In 2009, production stood at 20.65 trillion cubic feet (Tcf), net imports at 2.68 Tcf, and consumption at 22.85 Tcf. The projections for domestic natural gas consumption in 2030 is 26.1 trillion cubic feet per year, as compared with 24.13 trillion cubic feet in 2010. In the reference case, natural gas consumption in the electric power sector is projected to increase from 7.38 trillion cubic feet in 2010 to a peak of 8.08 trillion cubic feet in 2015. Natural gas use in the electric power sector declines after 2020, to 7.87 trillion cubic feet in 2025, as new coal-fired generating capacity displaces natural-gas-fired generation. Continued growth in residential, commercial, and industrial consumption of natural gas is roughly offset by the projected decline in natural gas demand for electricity generation. As a result, overall natural gas consumption is almost flat between 2020 and 2025. Natural gas (LNG), and remote resources from Alaska and the Mackenzie Delta in Canada. LNG imports, Alaskan production, and production in the 48 States from nonconventional sources are not expected to increase enough to offset the impacts of resource depletion and increased demand. The industrial sector was the largest consuming sector of natural gas. Production of gas from shale (such as Marcelleus) is likely to change the natural gas usage very quickly. Gas can be converted to oil. New gas to liquid fuel plants in the US are likely to change the oil imports scenario in the next two decades. U.S. coal production increases at an average rate of 0.7%/year from 2013 to 2030, from 985 million short tons (19.9 quadrillion Btu) to 1,118 million short tons (22.4 quadrillion Btu). Over the same period, rising natural gas prices, particularly after 2017, contribute to increases in electricity generation from existing coal-fired power plants as coal prices increase more slowly. After 2030, coal consumption for electricity generation levels off through 2040. Compliance with the Mercury and Air Toxics Standards (MATS), coupled with low natural gas prices and competition from renewables, leads to the projected retirement of 31 gigawatts (GW) of coal-fired generating capacity and the conversion of 4 GW of coal-fired generating capacity to natural gas between 2014 and 2016. However, coal consumption in the U.S. electric power sector is supported by an increase in output from the remaining coal-fired power plants, with the projected capacity factor for the U.S. coal fleet increasing from 60% in 2013 to 67% in 2016. In the absence of any significant additions of coal-fired electricity generating capacity, coal production after 2030 levels off as many existing coal-fired generating units reach maximum capacity factors and coal exports grow slowly. Total U.S. coal production remains below its 2008 level through 2040. The table below shows the vehicle fuel consumption and travel between 1960 and 2010. US Vehicle fuel consumption and travel between 1960 and 2010. Key: R = revised a Includes personal passenger vehicles, buses, and trucks. Source: 1960-94: U.S. Department of Transportation, Federal Highway Administration, Highway Statistics Summary to 1995, FHWA-PL-97-009 (Washington, DC: July 1997), table VM-201A. US electricity generation is expected to grow from 3.7 trillion kilowatthours in 2015 to 4558 kilowatthours in 2035. Growth in electricity use for computers, office equipment, and electrical appliances in the residential and commercial sectors is partially offset by improved efficiency in these and other, more traditional electrical applications, by the effects of demand-side management programs, and by slower growth in electricity demand for some applications, such as air conditioning. Most capacity additions over the next 10 years are natural-gas-fired plants, increasing the natural gas share to 26 percent and lowering the coal share to 20 percent in 2035. Nuclear and renewable generation increase as new plants are built stimulated by Federal tax incentives and rising fossil fuel prices. The nuclear generation (about 9 percent of total electricity supply in 2012) is projected to remain at about 9 percent in 2035. Generation from renewable resources is expected to rise from 8 percent in 2012 to 16 percent in 2035. Demand-side management programs address efficiency. By being more efficient, we can do more with less, and then reduce the demand for energy.